Bay & Canal Front House! Amazing Views! Pool, HotTub, Dock, Pool table, PingPong, Foosbal. 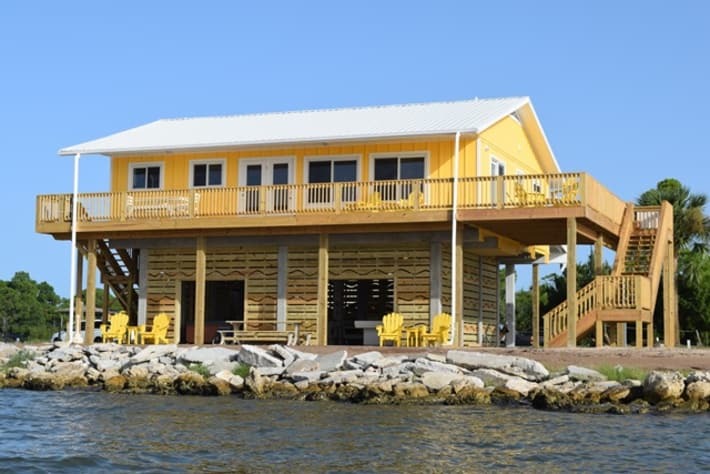 Shorely Fun is a renovated vacation home on the bay and also the canal! 2 sides of water offers privacy and views! 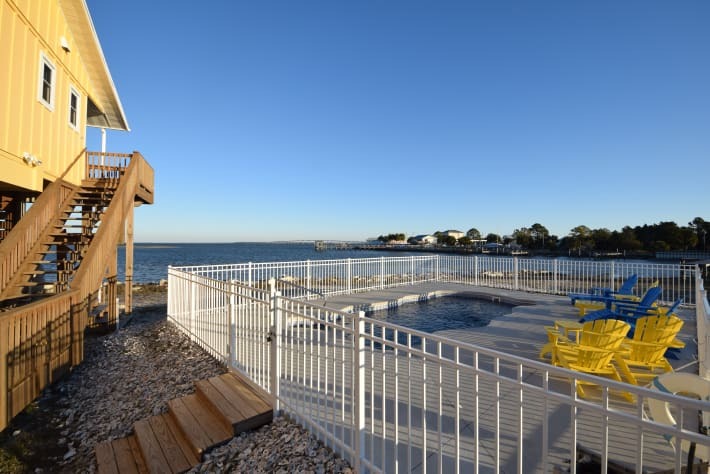 Enjoy wide the open water views while relaxing in the private in-ground pool! There is plenty of seating around the pool for sunning or just gazing out to the bay. 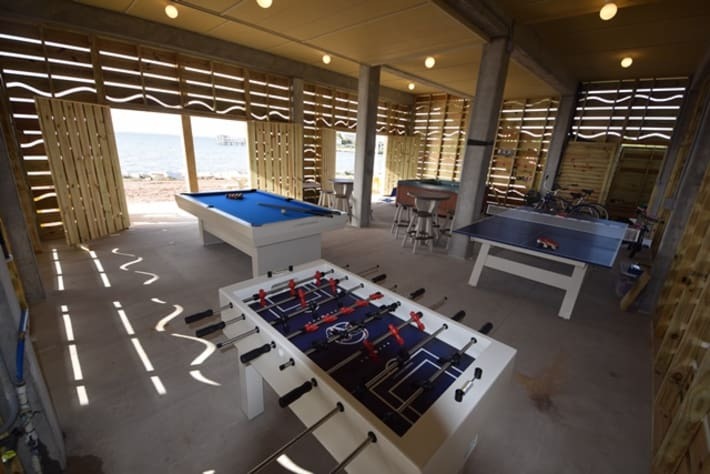 Plus, Shorely Fun has a hot tub (also with views), pool table, ping pong table and foos ball table in your private game room! 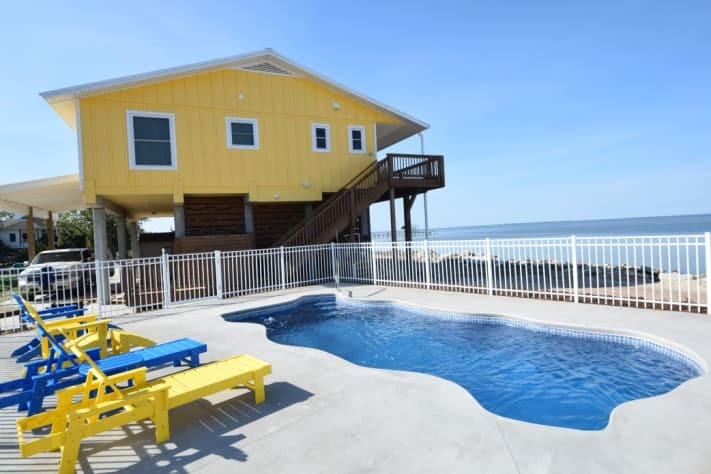 A unique St. George Island house experience! Imagine, no neighbors to the right, left or front ! Enjoy 180 degree views of the bay and surrounding area. 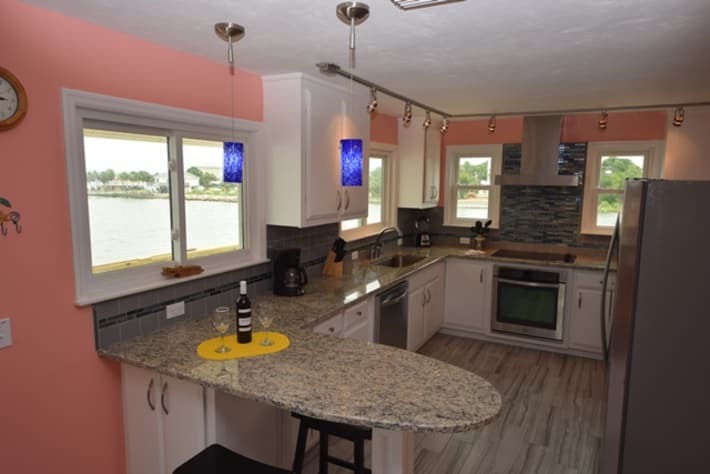 Your family and friends will enjoy this updated waterfront front home with many amenities, including the private game room , hot tub, boat dock and hot/cold private outdoor shower. Shorely Fun has large decks with plenty of rockers and outdoor seating to enjoy the view of the bay or dining al fresco. 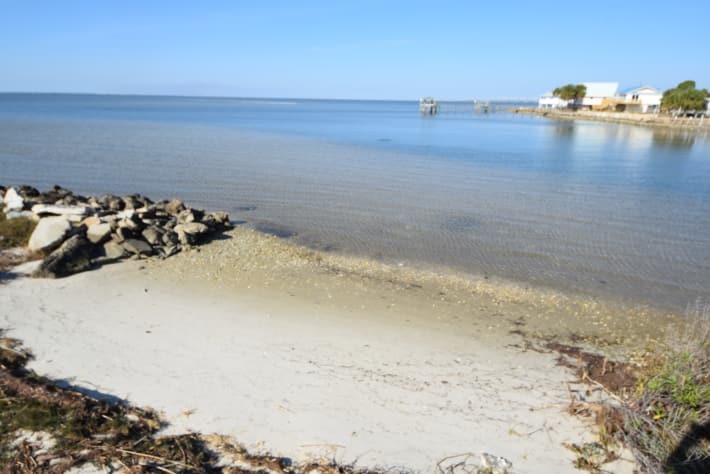 It is located in a quiet area, only minutes to restaurants, shopping, beach access and the St. George Island light house. 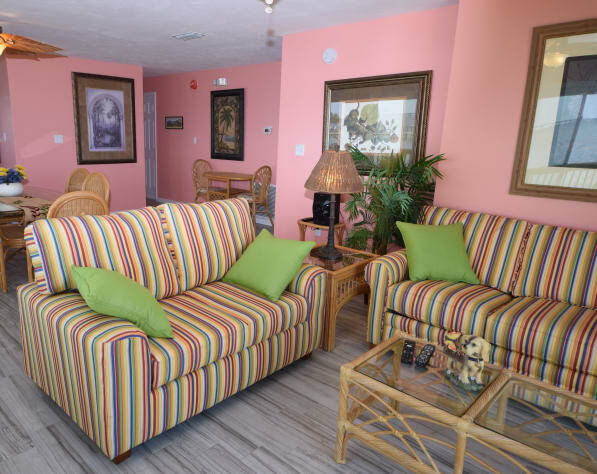 You will enjoy views of the sun rises and sunsets! 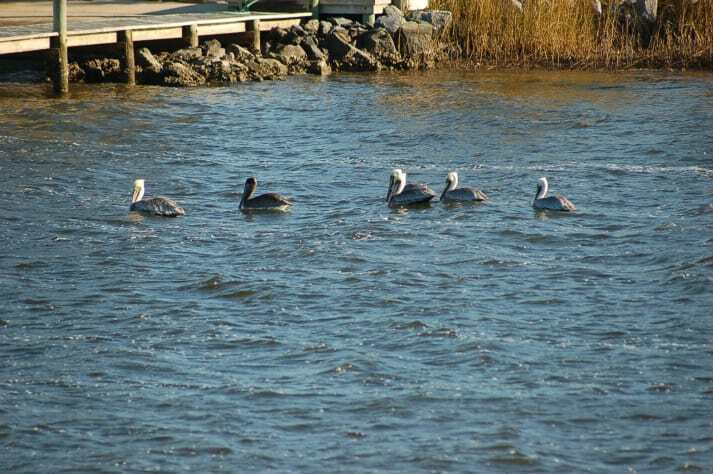 And enjoy watching the pelicans and dolphins right from the decks and pool. 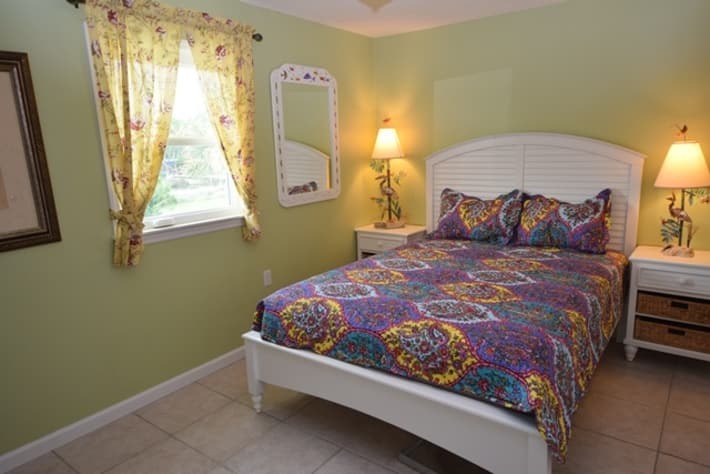 The house has 2 master bedrooms with king beds and attached bathrooms. 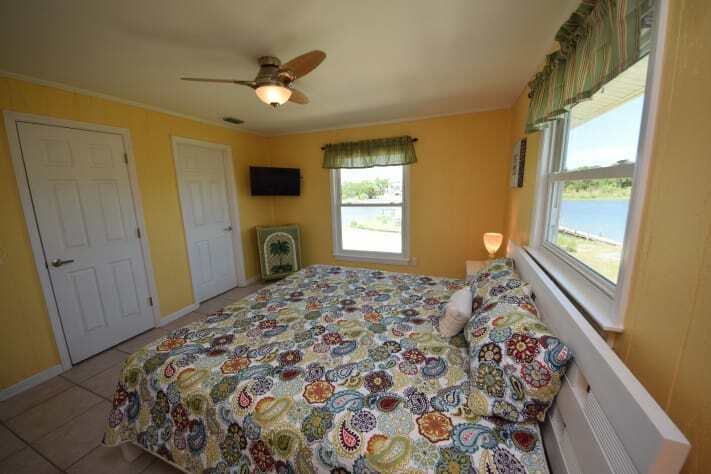 The third bedroom has a queen bed and there is also a 3rd bathroom. All bedrooms have cable TV. We even provide a pack and play for our small guests! The newly renovated kitchen has new stainless appliances, full size washer and dryer, large pantry, granite counter tops and is fully equipped. The living area has a TV, blu ray DVD and radio/CD player. The house also features free wireless internet and free local and long distance calls. Beach towels, bicycles and beach gear are supplied for free as well. Our guests also enjoy discounts from local gear rental stores! 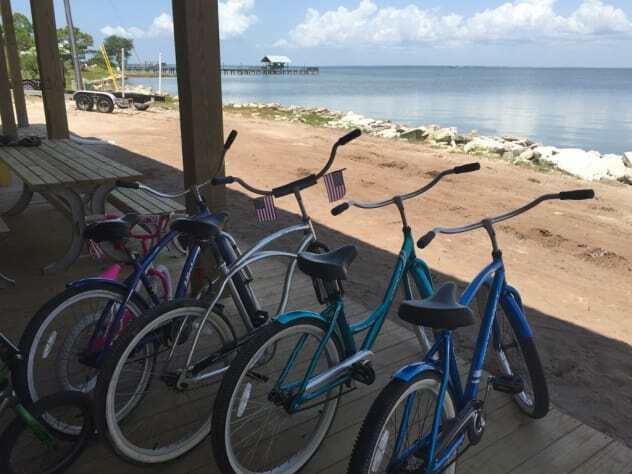 Shorely Fun is a short walk, golf cart ride or bike ride to the beautiful beaches of St. George Island . You can dock your boat at our private dock right in the back yard which has a fish cleaning sink, water and electricity. Your dog, big or small, is also welcome at Shorely Fun! (additional pet fee applies). Our decks have gates to prevent pets from running down the stairs. We provide a large pet crate, so you can travel lighter! 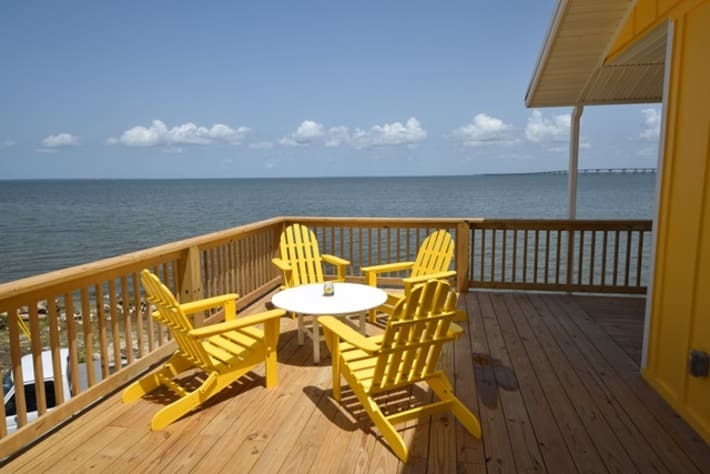 Kayak right from the back yard, fish from the dock, or just recline on one of the decks and enjoy the beautiful view. When you're done with the day's activities, enjoy the outdoor hot/cold shower and prepare the day's catch on the park-style charcoal grill. Shorely Fun will provide the exquisite vacation you want every year. We offer competitive rates and great customer service! Feel free to contact us for last minute specials. Book Shorely Fun now for your next vacation, you will be shorely glad you did! The location on the bay was great. There were beautiful sunsets every night and all I had to do was step out the door to enjoy. The house was roomy and fit our family of 7 comfortably. We loved the pool. Having bikes available made getting around the island easy. The whole family agreed the best vacation on St. George Island ever. The owners are so easy to work with and get in touch with. They checked on us and made sure our experience was perfect! 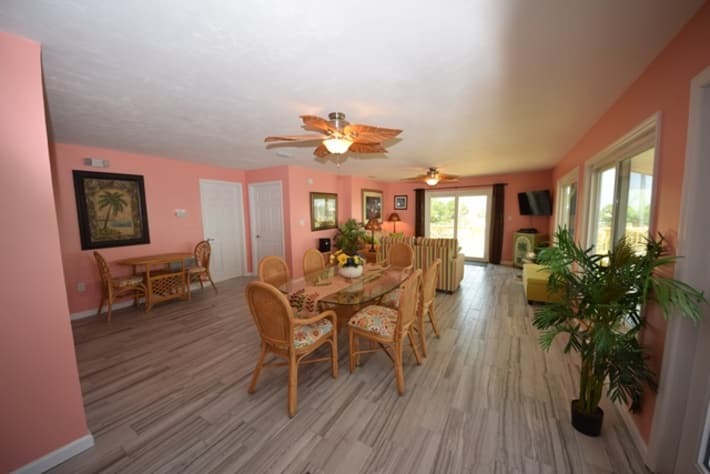 The home has everything you would want and more! Such a guest-centered place! We can’t thank you enough for sharing it with us! What doesn’t this property have??? There’s something for everyone! 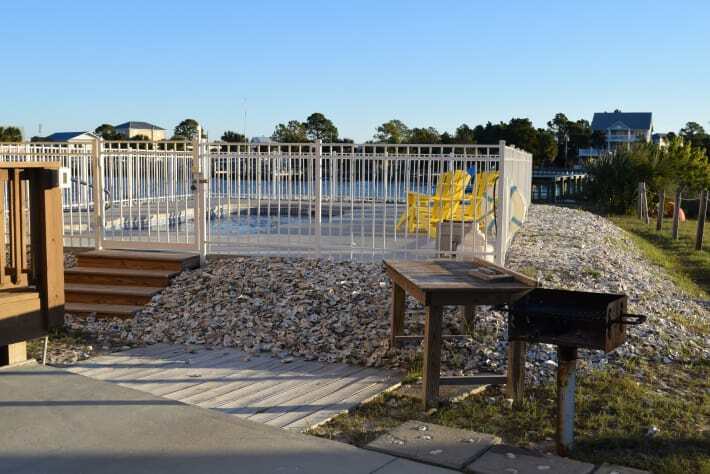 A dock for fishing, huge deck for lounging at sunset, and the pool is just the right size. 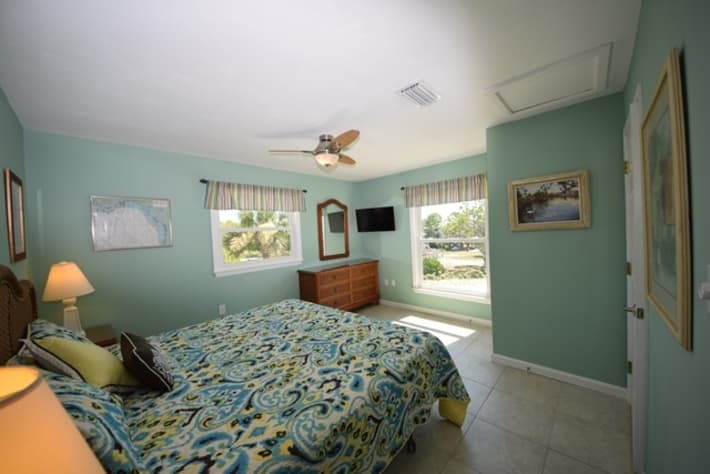 It’s beautiful view allows you to have an awesome vacation without leaving the premises. It was very clean and roomy for our 5 people. House is extremely well equipped with all you need. We took our German Shepherd and were very pleased to find the house doesn’t smell like dogs which is amazing in a pet friendly rental! We will definitely visit this home again, Tom and Lucinda were excellent hosts & on island during our stay. When told about a minor issue with the bicycles, they had someone there within an hour to take care of it. Couldn’t have been more pleased with this home! We had never stayed on the bay before, but were pleasantly surprised how relaxing and peaceful it was. The property and setting were exceptional, and convenient to everything. The house had all the amenities we needed and a lot of extras. We really enjoyed the pool and outdoor space. If I had to put one thing on the improvement list, that would be to put in a boat ramp on the property. Not sure that's feasible, but it would make the property even more attractive. Thank you for sharing your home! We had amazing sunsets. Dolphins visited daily. Had one of the best vacations. The house had everything we needed. We were able to leave our boat in the water all week. Did a lot of fishing. Enjoyed the pool everyday. We will definitely stay here again. We wanted to thank you so much for letting us enjoy your beautiful and amazing house. This house made our vacation more exiting and enjoyable. What a great and relaxing view! We had fun fishing and watching many kind of birds flying around us. Your house is equipped with all things the person can imagine especially the kitchen. 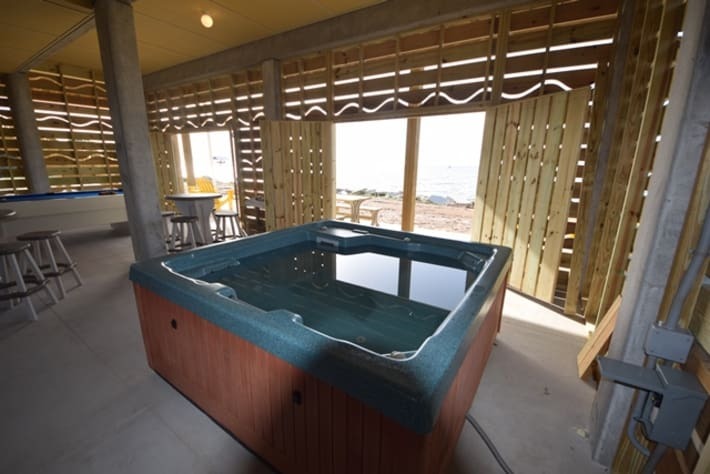 The game room and the hot tub let us enjoy more. We thank you again Tom & Lucinda for your care even for small details. 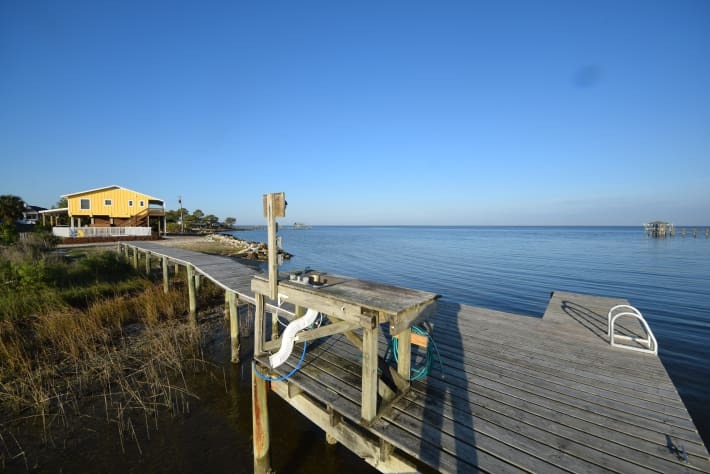 We cannot rate this beautiful bay front home more highly! Stunning, daily changing views and amazing sunsets at the end of the street. The bay and location is just breath taking. The home is gorgeous and well appointed, we never considered a non beach location (though its less than 10 mins walk), before, and we are so glad we booked Shorely Fun and have had the most amazing week (including our Chihuahua, Sarah). 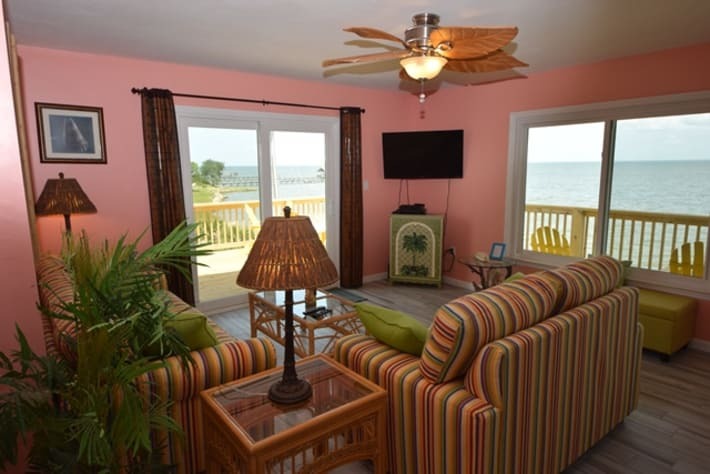 There is so I much to do if your a family, with their games room and hot tub, rent a canoe or paddle board on the bay, go crabbing on the rocks or jetty, ride the bikes up the quiet Floridian streets to the beach and so much more. If you love oysters, be sure to go to “Paddy’s Raw Bar, for a beer and fresh oysters - heavenly! Tom and Lucinda are a joy to deal with and are so responsive and helpful, it was a great pleasure to meet them (and their doggies)! 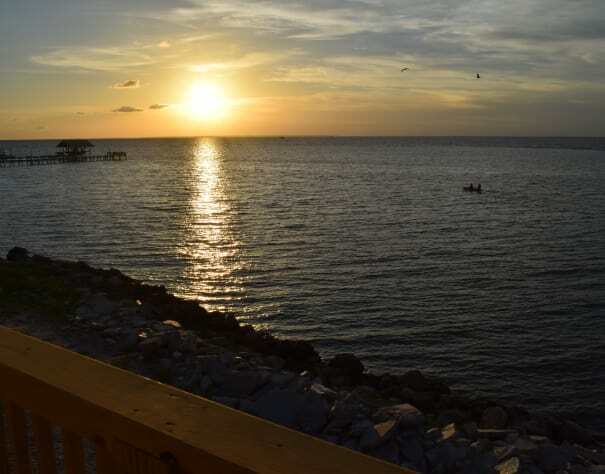 SGI is a great destination and wonderfully eclectic and romantic, we cant wait to get back here and to stay at Shorely Fun - Thanks for making our vacation so wonderful! ‘Five Star’s !!! 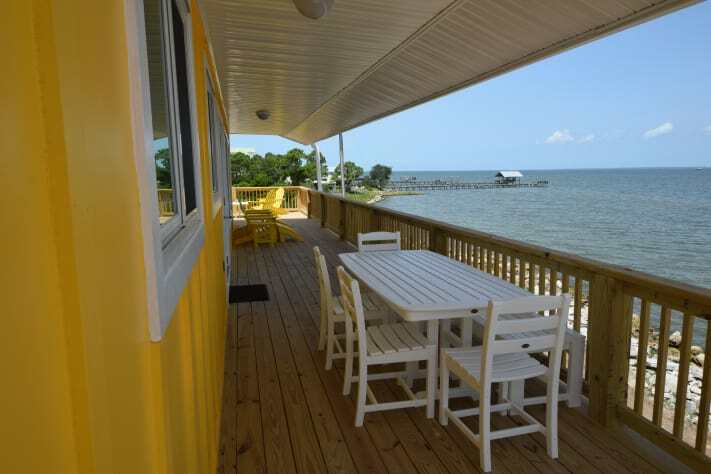 This is a wonderful vacation home on the bay. The house was great with everything we needed. We fished off the dock, kayaked in the bay , played ping pong in the game room and rode bikes around time. Love love this ideal beach house and Tom and Lucinda are great hosts. They really care about our wants and needs. Super dog friendly as well ! Will definitely stay here again. The house was very clean and well constructed. 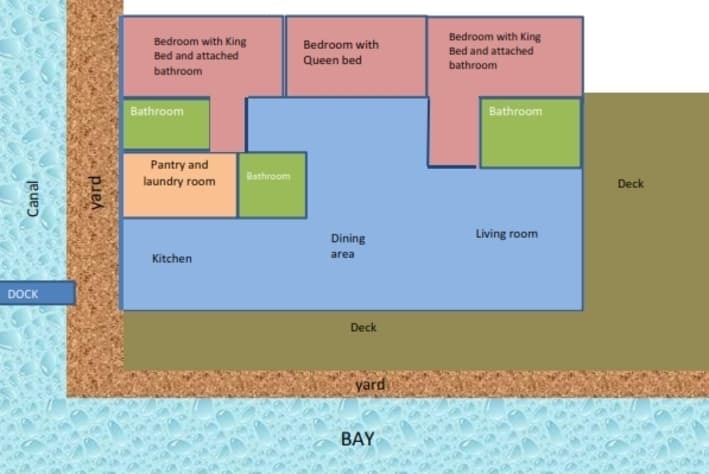 It was nice having all the living quarters on one floor and there was plenty of space for four adults, two dogs and two children. There were cleaning products and brooms/sweeper to help us keep the place neat. The pool and hot tub were constantly monitored by a pool service while we were there. We did spend more time at the pool than on the beach at the golf side. The location is absolutely excellent for dogs, kids and adults. There is a small beach area where the dogs can get in and swim, as well as to launch a couple kayaks. We have two german shephards and they enjoyed many hours on the large deck which has gates on either end. The location was very private and safe for the boys (ages 9 & 11) to grab a fishing pool and fish from the back of the house or from the private dock anytime they wanted. They had a blast catching crab too! The island itself has a very relaxing atmosphere and the restaurants were all within a bike or golf cart ride from the house. All the people we met (residents and vacationers) were very friendly. From the reactions we received from all the residents/shop owners, Tom and Lucinda are very well liked on the island. 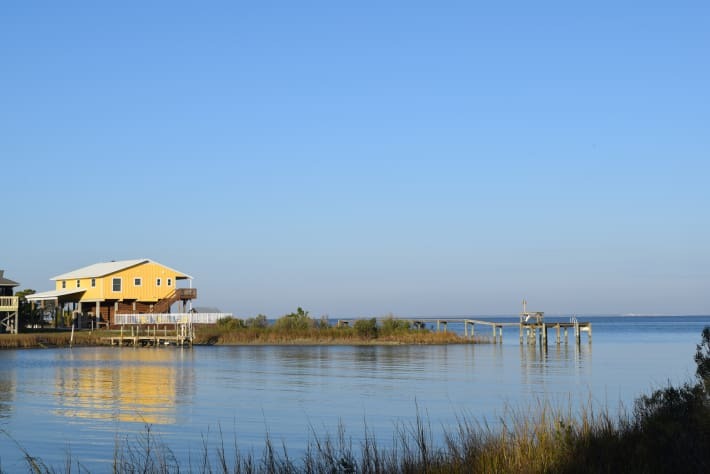 I would absolutely recommend anyone to stay at Shorely Fun if they are planning on visiting St. George Island. We highly recommend Shorely Fun. The view is breathtaking!! 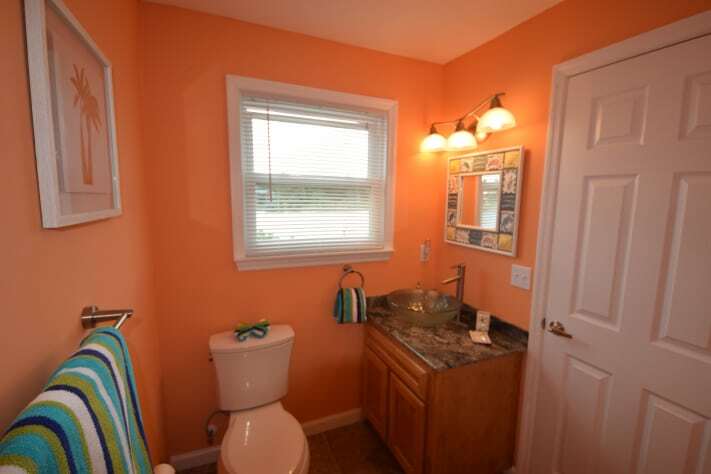 The entire property was clean and well maintained. The house was the perfect size, all 3 bedrooms were a nice size, and the kitchen was loaded with everything needed. The gates on the porch were so nice to keep toddlers and fur babies to be able to enjoy being outside on the wonderful porch. The pool was beautiful. Oh and the sunsets wow !! The game room downstairs was an added bonus And I can't thank the owners enough. They were very prompt and helpful on all communication. This was our favorite family vacation !! Looking forward another week next year. 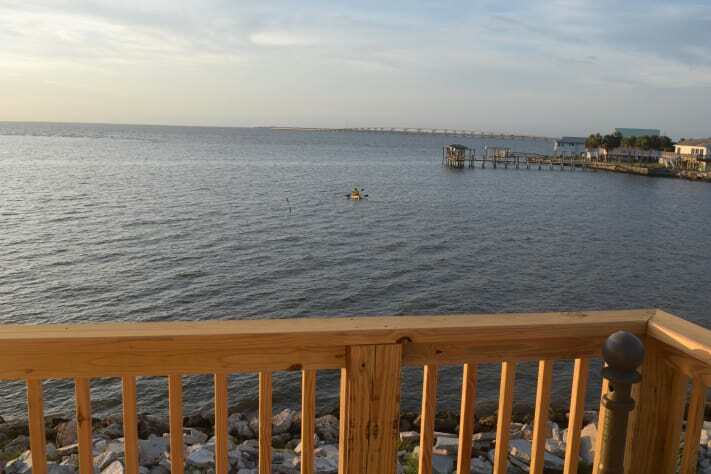 Excellent view and good access to the water for fishing. Will definitely stay here again.